We're the heart of The Golden Triangle. Beautiful & bespoke Big Days. Freshly-cooked, served with a smile and a warm welcome. 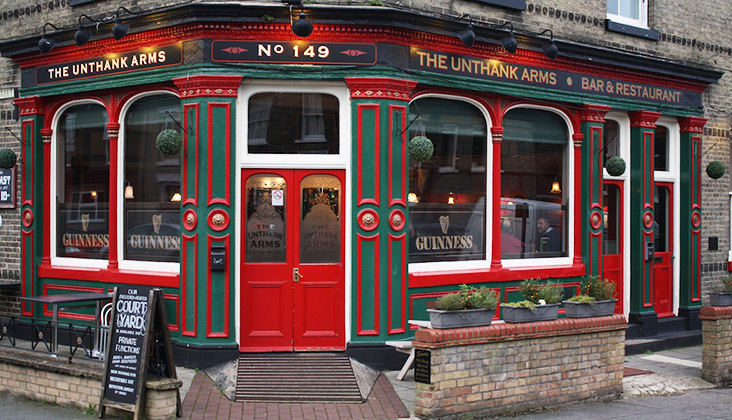 The Unthank is a traditional Victorian local with a lively bar serving real ales, premium lagers and over 30 wines. We serve an extensive menu with mouth-watering classic dishes and great value daily specials. See our ‘Food & Drink’ page for our menu. Upstairs is a large, airy restaurant (serving the same delicious food) which is also available to hire for functions including weddings, birthdays, christenings, etc. See the section on Weddings and Parties for more information. We also have a large garden – perfect to relax in during the summer, with a beautifully appointed covered Courtyard and ample parking. We serve delicious food daily with an extensive menu and daily specials starting at only £6.50. You can eat in the bar, bistro, upstairs, the Courtyard or garden and choose from a quick bite to a relaxing meal. At weekends we serve breakfast and delicious Sunday Roasts including Norfolk beef and pork, chicken and homemade nut-roast. Booking is always advisable but especially if you are part of a larger group, want a table in a particular spot or are in a hurry. Call us on 01603 631557.